As delivered, these eight LDS6B buses had the Cave-Brown-Cave heating system installed and, as seen in the photograph, lacked a conventional radiator at the front of the engine bay. The deficiencies of this heating/cooling arrangement, especially apparent with the overheating prone BVW engine, led to its subsequent disconnection and the fitment of a normal radiator, though the cooler running Gardner powered Crosville prototype retained its Cave-Brown-Cave heating and blank front panel with winged motif to the end. OPN 807 served with BH&D until January 1969 when, under NBC “rationalisation”, it passed to Southdown ownership with all the BH&D operations. Withdrawn in 1972, it then went on to Brittain’s in Northampton http://bcv.robsly.com/ who sold it, ostensibly for preservation, in June 1979. 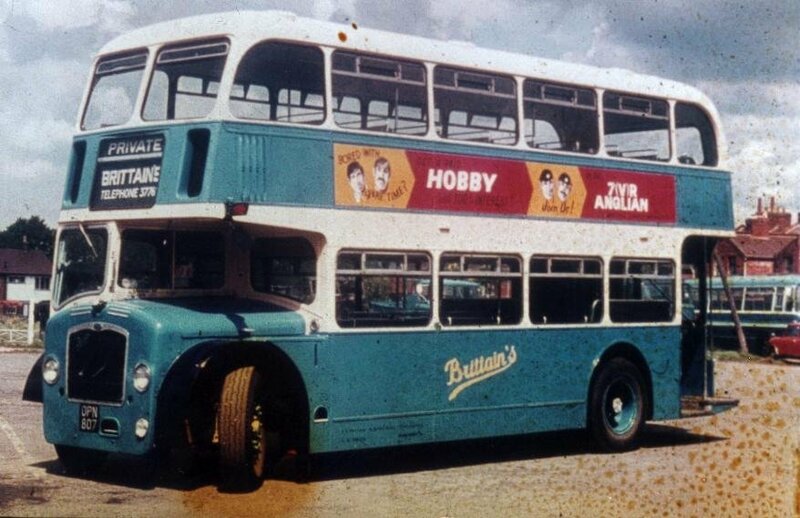 Having since passed through a number of supposedly preservationist hands, it would seem that it still exists in the current ownership of a dealer, the London Bus Export Company of Lydney, though its current condition is uncertain. If it still retains its BVW engine then spares for that will be scarcer than hen’s teeth. Prodded by Roger’s item, I Googled LDX 003 and found Nigel Furness’ book mentioning LDX003 and LDX004 both of which had passed me by! His book also adds that BCV changed the designation of the six LDL 30′ chassis built in 1957 (eg Bristol L8450 – see http://www.old-bus-photos.co.uk/?p=34464 to LLD after they were built which explains why I had come across this confusing reference at some time whilst at BCV. Roger’s photo reminded me of one that I took at BCV in early 1964 showing no. 4 with two non-standard to Tilling Group features of these vehicles: the split step (making a ‘stepless’ entry into a stepped access! ); and the side route no. indicator. The first feature is still extant in the photo-link of no. 7 in Brittain’s ownership. When I took the photo I had just arrived back at the factory at Brislington after a long spell with BOC so was not aware why no. 4 was at BCV. It was the first of the eight LDS chassis built at the end of the 138th sanction for BH&D, although the last three with convertible open top bodies were given fleet nos. 1 -3. I also have a note to say that its BVW engine was fitted with a DPA (distributor) type fuel injection pump, instead of the original in-line fuel injection pumps of either CAV or Simms manufacture. I’m not aware that this cheaper component was adopted as a standard in later BVW engines. Whoops – got confused. This photo is of BH&D no. 54, not 4 and hence is an FS6B of the 214th sanction dating from 1964. The bit about DPA pumps definitely refers to 5no. 4! Thanks for the picture of the "stepless" door platform on these buses, Geoff. I had completely forgotten about these, but I now recall that they were held to create more platform stumbles than they sought to eradicate. Your reference to the use of DPA fuel pumps on these early BVW engines is notewothy. DPA pumps appeared in the mid to late fifties on smaller engines, but this must surely have been one of the pioneer applications on a relatively large commercial vehicle engine. Was it intended to thus equip the production BVW as standard? I am not an engineer, just an interested layman, but I can recognise the appeal of the DPA against the traditional, much more costly, in line pump. The DPA has to work harder serving all the injectors, but the advantages of cheaper and easier replacement together with simplified calibration must have been attractive. Was reliability a problem, and did these early Lodekkas keep these pumps? I remember these Lodekkas from my gap year conducting from Conway Street in 1969/70. 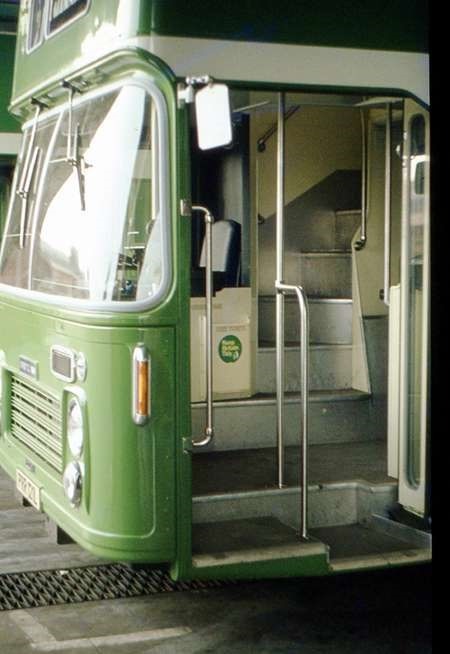 The lowered rear platform step was said to be popular with all the old ladies of Hove but in rush hour with visitors and foreign students they were also what we now consider a trip hazard. Happy days! As of Feb 12 it was still at Lydney. Gossip says it was possessed over an unpaid bill. I would have thought offering it for continued preservation would have attracted a buyer. 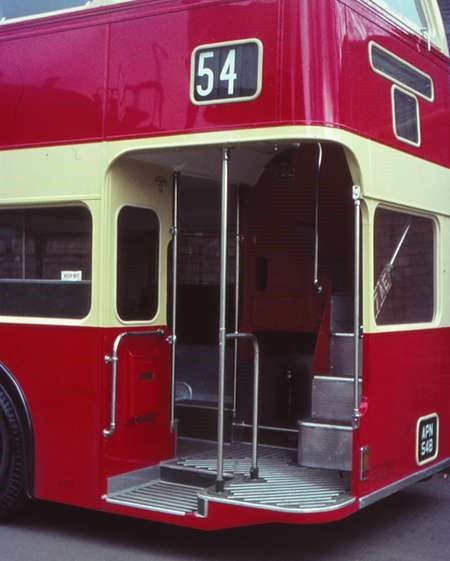 Reading Geoff Pullin’s post regarding Brighton & Hove APN 54B and its modified entrance step, it put me in mind of a similar design modification applied to a East Midland VR some 9 years later. PRR 121L and its low entrance step option was presented to the local press in Mansfield as a help to the aged and infirm. I don’t know how long it lasted but photos on the web show it had gone by the time Yelloway became the owners. I captured my picture when nearly new at Mansfield depot. Berisford’s photograph of East Midland VRT PRR 121L’s step arrangement has reminded me that one of East Yorkshire’s 1973 VRTs (932) was similarly treated, but was converted to standard layout in later life. Maybe such experimental steps were more widespread than maybe first thought. I seem to remember that ECW did about half a dozen VRTs with this step as an experiment in 1972/3 – another one was Trent 631 (RCH 631L), which was converted to normal within a year or so. Roger asks about the DPA fuel injection pump. To my knowledge it was never used on production BVW engines, but others may know differently! I can’t find any information about its introduction to other makes of engines but remember that it was used by Leyland on 680 engines in AN68 Atlanteans and later Leopards and probably Panthers. I can’t remember about the 500/510 series. The DPA did have some reliability problems but the reduced initial cost and ease of replacement was probably thought to compensate in Leyland’s eyes. It was not suitable for increasing power outputs at a time that competition was pushing them up. The ‘Power Plus’ series of 680 engines used in trucks were fitted with in-line fuel injection pumps and that was the engine used in the Ribble / Standerwick VRL/LH coaches and why they were able to go ‘uphill at 70mph’ compared to 36ft Leopards, which were stuck with the DPA version because the in-line pump would foul the chassis frame. We had to wait for the Tiger before this power problem was sorted! From memory the later 680’s had an F&M Friedmann and Maier injection pump fitted. Geoff, thank you for the fascinating information regarding BH&D 4 being fitted with a CAV DPA distributor type (sometimes known as rotary) fuel injection pump when new, as I had no idea of such an experiment. As you comment, the standard BVW engine was fitted with an in-line injection pump of either Simms (SPE type) or CAV (N type) manufacture, although I seem to recall that in later years the CAV pump became the norm. West Yorkshire’s 0.680-engined Bristol RELHs and Leyland Leopards were fitted with DPA pumps as standard, apart from a handful of WY’s last Leopards which had Austrian-built Friedmann & Maier (F&M) in-line pumps. F&M injection pumps were also used on Leyland-engined Leyland Tiger TR and National 2 models. The Leyland 510 engine fitted to the National 1 used the CAV NN-type pump, which was a development of the N-type, the immediate difference being that the NN had its oil supplied from the engine lubrication system, whereas the N was simply ‘splash fed’ by oil from its own small ‘sump’. Also, on the National engine the injection pump was laid on its side rather than being vertical. As Roger says, the cheaper initial cost, ease of removal/replacement and simplified calibration were in the DPA pump’s favour, but I would tend to agree that the pumps would have had to work harder than a larger in-line pump on more powerful engines. The main problem WY had with DPA pumps related to fuel leaks, mainly although not solely, around the banjo bolts retaining the high pressure outlets to the injector pipes. I think Geoff is correct in thinking that the DPA pump was not suited to the steady increase in power outputs on large diesel engines in later years, although CAV did introduce the DPC (Distributor Pump, ‘C’ type) to help counter this, but I’m not sure as to its success. Going back to the DPA pumps, it came as something of a surprise when I first saw one on a 0.680 Atlantean engine. The pump looked so small on the side of such a large engine, especially when compared to the very large (but admittedly long-lived) injection pumps used by Messrs L Gardner & Sons on their range of engines! 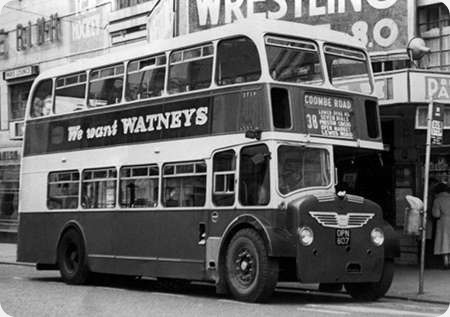 The Wulfrunian became the standard double deck purchase for West Riding from 1959 to 1965, by which time the profound deficiencies of the design had rendered it unsaleable to everyone else. When, in 1967, West Riding sold out to the nationalised Transport Holding Company (soon to become the National Bus Company) the new proprietors set about getting rid of the troublesome Wulfrunian fleet. 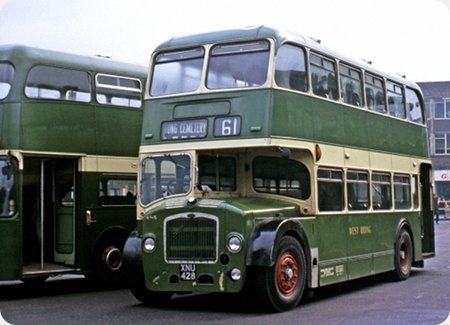 A miscellany of double deckers from other NBC companies began appearing in West Riding green livery (the ex tramway red colour was abandoned, though NBC poppy red was soon to follow) and all the Wulfrunians went between 1968 and 1972, but only after donating their 6LX engines to new incoming Daimler Fleetlines. Seen in Leeds in April 1970 is No.405, XNU 428, ex Midland General 444, one of an entire batch of ten 1955 vintage Bristol LD6G with ECW H33/25RD bodies that passed to West Riding in June 1969. These ex Midland General Lodekkas did not last very long with their new owners, all ten being sold in July 1971, when XNU 428, by then 16 years old, went for scrap. I am sure that you are right, John. I was relying on my unreliable high mileage memory, but I was, myself, a bit doubtful that West Riding would be running from Leeds to Tong Cemetery in Bradford. Thanks for the correction. Interesting link Roger about the Wulfrunian- thanks. The flaw in them must really have been the Gardner engine, oddly enough- too big, too heavy. Yes, it looks like the old Wakefield Bus Station with Union St behind. Remarkable that they repainted these buses so thoroughly when they only had two year’s life. That’s not a Wulfrunian behind as you may expect- but presumably a Fleetline? The taller drivers of these Lodekkas always looked so uncomfortable with the angled steering wheel and their legs splayed out on to the high floor. Were they? I have driven some Lodekkas in my time, Joe, but, after escaping from Halifax Traffic Office in 1966, I went to Aldershot & District as a driver for some 18 months before returning to the admin side of the bus industry. The Lolines were superb machines, particularly the Mk.IIIs, and the driving position (which was not dissimilar to that of a car) soon felt quite normal. Turning the angled steering wheel in tight corners was easier than reaching across the "traditional" flat wheel of other makes (especially if one had something like a heavy PD3 to deal with). The Lolines were the best buses I have ever driven, and I’ve sampled quite a few types over the years. You were correct John regarding the late evening service. On Saturdays the 2150 from Wakefield bus station ran as far a Tong Cemetery returning from there to Wakefield at 22:36. The last through service to Bradford ran at 21:33. I managed to pick up a West Riding Time Table for 1970 somewhere along the rallies I attended so was able to check with that. I could never understand why West Riding persevered with the Wulfrunian for so long after the shortcomings must have been fairly obvious with the first batch. Bury, LUT, West Wales, Accrington and County soon got rid of their examples yet West Riding was still ordering sizeable batches. Did they have some sort of contractual commitment to Guy? The failings must have been wider than the problem of combining a heavy front engine with the entrance as the two Accrington ones had rear entrances and a much reduced front overhang but they still didn’t last long. 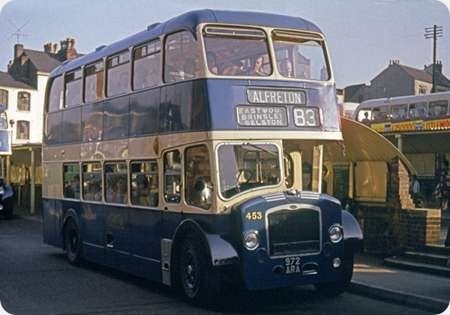 Wolverhampton 71 was an interesting one as this had a forward entrance and I understand drum brakes and seemed to have a more successful service life. Just a guess, but I think the reason why West Riding kept taking repeat batches of Wulfrunians in fact right up to 1965 when it was pretty obvious from the first batch that the design was flawed was because they had to keep faith with Guy Motors because I was told the West Riding GM who had a massive input in its design & actually got West Riding to build it. I think the West Riding GM was called Ronald Brook and he touted the Wulfrunian design around various manufacturers, AEC being mentioned. When West Riding decided to cut their losses & rid themselves of the Wulfrunians,the Halifax Lolines, old Bristol LDs, superior ex Bristol O.C FLFs and keeping lowbridge Guy Arab lVs longer plus new Fleetlines saved the day. All was not lost as a lot of valuable Gardner 6LX power units were salvaged & put in new Fleetline chassis.